Lord Jagannatha is blessing the devotees from the sanctum facing west. The vimana above presiding Lord is called Mandhara Vimana. Nandhi and emperor Shibi had the darshan of Lord in the temple. Jagannatha Perumal Temple at Nandhipura Vinnagaram is one of the 108 Divya Desams. This temple is more commonly known as Nathan Koil. As this temple resembles the Puri Jagannatha temple, it is also known as “Dakshina Jagannatham”. This place was once a forest of Shenbagam flowers and hence is known as Shenbagaranyam, meaning forest of Shenbagam. 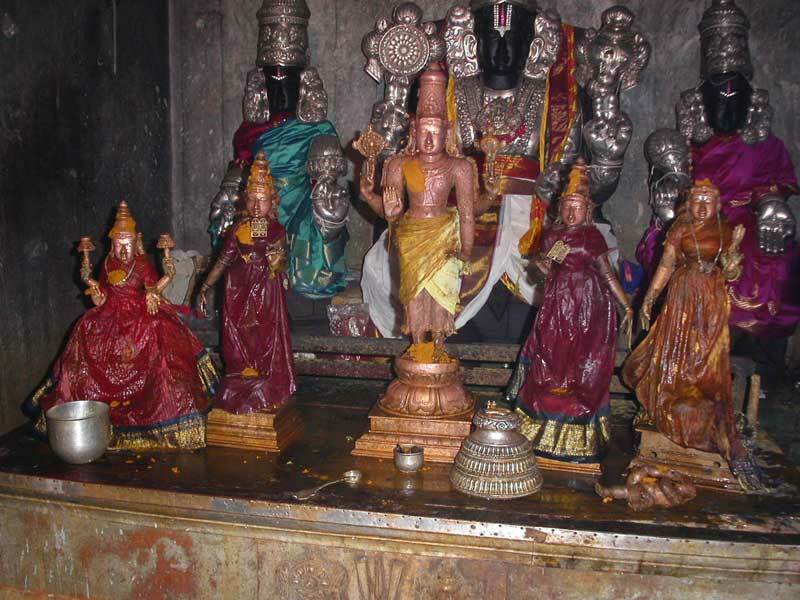 The moolavar or main deity of this temple is Srinivasan or Nathanathan.The utsavar (the deity taken out in processions) is known as Vinnagara Perumal or Jagannatha Perumal. His consort is Shenbagavalli Thayar. The Lord is present in a sitting posture, with sword, bow, chakram (discus), sangu (conch) and Dandam (stick) in his hand, under the Mandara Vimanam facing west. The holy water is Nandhi Theertham. This village was established by Chola King Nandhivarman. He also built this temple here. Nandi – Lord Shiva’s vehicle – is associated with the legend connected to this temple. Nandi once wanted to have the darshan of Lord Vishnu and proceeded to Vaikuntam. At the entrance, he was stopped by the dwarapalakas (sentries) of Vishnu. An arrogant Nandhi tried to force his way in, because of which the dwarapalakas cursed him. As advised by Lord Shiva, Nandi went to Shenbagaranyam near Kudamuku (Kumbakonam) and performed penance to Lord Vishnu. The Lord appeared before him and absolved him of the sin. This is the reason for the place being called Nandhipura Vinnagaram. A niche of Nandi is seen on the outer wall of this temple. The Lord here was originally facing east. Sibi Chakravarthy’s story is attributed to the reason for the Lord facing west. Sibi Chakravarthy was a righteous King who was known for his truthful and just ways. Once, Dharmaraja decided to test him. A pigeon that was being chased by an Eagle came to the King seeking asylum. The King promised to protect the pigeon. The Eagle that soon came there wanted the pigeon to satisfy his hunger. The King was faced with a dilemma because he had to save the life of the pigeon that had sought protection. At the same time, he could not deny the eagle of its right and let it stave. He offered his own flesh equivalent to the weight of the pigeon in lieu of the pigeon’s life. The eagle agreed. Any amount of flesh from his body would not suffice to equal the weight of the pigeon. The King finally offered his whole body to the eagle. Dharmaraja who was in the form of the eagle and Indran who was in the form of the pigeon were pleased with the King’s commitment to protect the weak. The Lord at Nathan Koil is supposed to have turned towards West to witness this event. There is also yet another reason attributed to the Lord facing west. There was a misunderstanding between Lord Vishnu and Lakshmi because of which they were separated. Lakshmi wanted to win back a place in the Lord’s heart and was performing penance at Shenbaranyam facing east. Pleased with Her devotion the Lord gave her darshan. Since He was already facing East, He had to turn towards west for gicing Her the darshan. This happened on Ashtami (8th day from New moon or full moon) of Shuklapaksham (waxing period of the moon, period from new moon to full moon), which was a friday in the tamil month of Aipasi. Since the Lord and His consort were reunited at this place, praying at this temple can ease tensions in marital life. Praying here will reunite one with his/her separated spouse. Sri Sooktha Homam is performed here on the shuklapaksha ashtami days. Performing this homam on eight consecutive shuklapaksha ashtamis will result in the devotee being blessed with prosperity, fulfillment of desires and overall happiness. Nathan Koil is one of the Vaishnava Navagraha sthalams around Kumbakonam. It is associated with Chandran. Chandra dosha parihara pujas are performed at this temple on Mondays. Nandhipura Vinnagaram is about 9 kms from Kumbakonam. It is in the Keezha Pazhayarai area, which was the ancient capital of the Cholas. Patteswaram famous for it Durga temple is just about 3 Kms from here. This is a remote village. The buses to this place are not very frequent. Take a bus from Kumbakonam that goes towards Udalayur. Alight at Keezha Pazhayarai and the temple is about a kilometre from there. The temple is open from 8.00 a.m. to 12.00 noon and from 4.30 p.m. to 8.00 p.m.